Q. My A/P Aging Report doesn't match my User Defined (UD) Report for the A/P ledger account, and when I run a detail report option 7 there are a lot of unmatched entries. What is going on? Next run the A/P Detail Report using option 7 (Invoices with Payments), making sure that the date range begins with the date of the earliest invoice date on the invoice for which the payments have been made. For example, if you received money on 7/1/09 for an invoice that had an invoice date of 5/1/06 you would need to open up your date range to include 5/1/06 so that you have an invoice to match the payment up with. In doing so, you can see the unmatched entries and look for errors, mismatched vendors, invoice # typos, double payments, etc. The errors or unmatched entries will be shown in orange. Fix the errors that are shown; overpayments can be fixed by putting in a dummy invoice for the amount and then entering a credit invoice. Payments entered as a check (or deposit) entry instead of through the A/P payment routine. Vendors or invoice numbers that don't match. For example, if the invoice was to "ABC Farm" and you applied the payment to "Abc Farm," the system will consider these two different vendors. Or if the invoice number was typed in as "12345" and when paying with a check it was entered as "012345," again the system will not match up to two entries because of the variation in the invoice numbers. If a payment or invoice is altered or edited it could cause it to unlink. Along those same lines if there was a change to the amount due field after a payment was made, resulting in an overpayment, you would see an unmatched entry. The last few things to keep in mind are that if data recovery was run on another machine which didn't have the year's data that contained the original invoice or that entries were made on an older version of FBS software, a version which allowed the description on payment to be changed. If data recovery was then run on the newer version the link would be removed because of invoice numbers no longer matching. The system will also flag an entry if you have an invoice that has been open for a long period of time, say several years, there may not be a problem with the entry, but the system will still flag it because it has been outstanding for so long. Make sure that you don't have an invoice dated after the due date (for example, an invoice dated for 6/30/09 and a due date as 1/15/09). Check that the beginning balance of the current year matches the previous year’s ending balance. Always use the Pay A/P Entries for writing checks or the A/R Money Received for recording deposits rather than going through the standard Checks or Deposits screens. Be aware of your invoice and due dates; for the Aging Report to work correctly these dates need to be recorded and they need to be correct. When selecting vendors during A/P or A/R Invoice entry maker sure there are not duplicate vendors with similar names. Get into the routine of running the A/P and A/R Detail Reports using Option 7 on a regular basis to trap unmatched entries and errors to correct them in a timely manner instead of allowing them to accumulate. In September, 2008 we first alerted our readers that mass-market retailers were bundling the Vista Home Premium 64-bit operating system, rather than the standard 32-bit version with some new computers. With the arrival of both Windows 7 and the 2009 Christmas shopping season the 64-bit trickle has turned into a torrent. In fact, unless you’re shopping on a website that caters to businesses you’ll have to search far and wide for a computer installed with a 32-bit operating system. Why is this critical? While 64-bit machines are optimized to process graphics and play the latest games, they aren’t compatible with many farm and business applications, including mapping and accounting/management systems like FBS Windows versions 8.0 and older. Because of this inevitable transition, FBS has been diverting significant time and resources to convert all of our Windows software to the .NET platform, opening the door for 64-bit compatibility as well as future web applications. These changes will be incorporated in the upcoming FBS Version 8.1, which will be released soon. For a list of new features in Version 8.1, go the FBS Website Homepage. (Most of these changes are already available via download (Utilities Check for Updates). If you are purchasing a new computer this year, make sure you select either XP, Vista, or Windows 7 32-bit editions. Don’t expect informed advice from the “big box store” salespeople—they’re stocked to the ceiling with 64-bit boxes and have no appreciation for ag software or even business applications. For those of you who have already purchased 64-bit versions of Vista or Windows 7, short-term work-arounds are still possible (Virtual PC, Remote Desktop or using an older machine to run your farm applications). Long-term solutions—for FBS and other programs—may still be a few months off. We’ve recently attended the annual meeting of the American Society of Agricultural Consultants in Nashville, Tennessee. Founded in 1963, ASAC continues to be a premier organization for agricultural consultants worldwide. 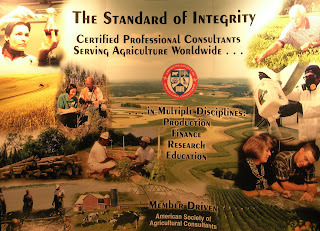 It’s a non-profit organization oriented around raising the standards and image of professional agricultural consultants. ASAC members have expertise in many agricultural disciplines including, Agricultural Food and Animal Production, Farm Management, Biotechnology, Farm Management, Finance, GPS/GIS Systems, Environment, Sustainability, Irrigation and many more. Maintain highest standards of certification and ethical behavior. Provide quality member services and continuing education. Help its members provide clients with the best objective advice. Match consulting needs with member expertise. Beginning this month our newsletter enters an exciting new era. 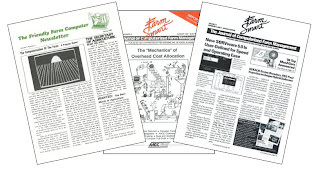 Launched in 1981 as The Friendly Farm Computer Newsletter (later FarmSmart), this publication converted to a monthly all-electronic format in 2001. Now we're taking the next logical step--the "blogging" format to make FarmSmart more interactive and useful. Rather than published just once a month, news will be disseminated several several times a week. Therefore, we encourage you to check this site regularly. You are welcome to add your comments and questions directly, thereby adding value for everyone.